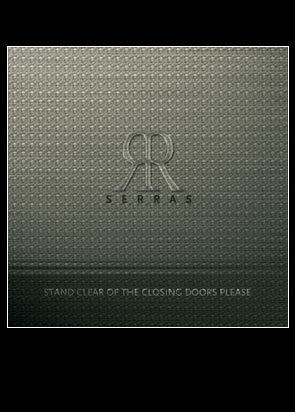 Serras "Stand Clear Of The Closing Doors, Please"
When we formed Serras six years ago, it was evident for us to take a starting point in Danish 18th century music because the tunes from that period are so strong. Since then, we have played a long row of concerts in Denmark and abroad, and we have recorded two CDs with new arrangements of music from that period: “Serras” and “Second Hand”. We are happy now to present our third album that, besides one theme from the 18th century and an old psalm the 19th century, consists of new compositions. The music, however, sounds unmistakably like Serras seeing that our folk musical roots still make the starting point for melodies and arrangements. Besides our own compositions, we have borrowed a few themes from some of our friends, and at one recording, we were lucky to have the folk music group, Lang Linken (the godfathers of folk), appearing with their fantastic music. Read about the cd's "Serras" or "Second Hand" or "Ø"